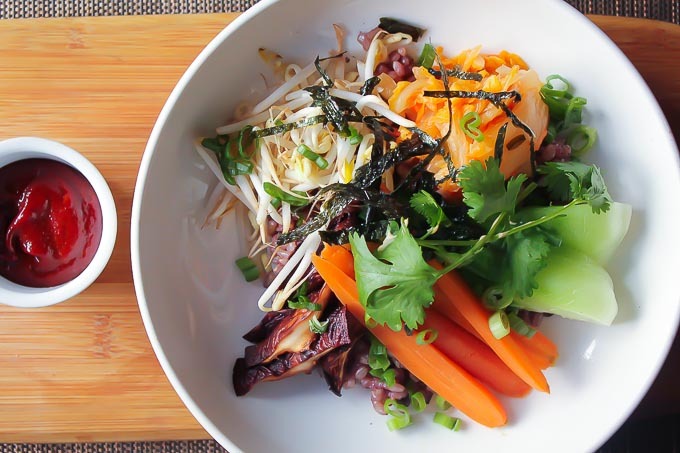 Bibimbop is my go to meal when eating out-I love the combination of savory mushrooms, fresh crisp sprouts and carrots, sea vegetables, chewy brown rice, and tangy-spicy kimchee. You can spice it up you like with the garlicky Korean hot sauce gochujang! This is the original rice bowl! 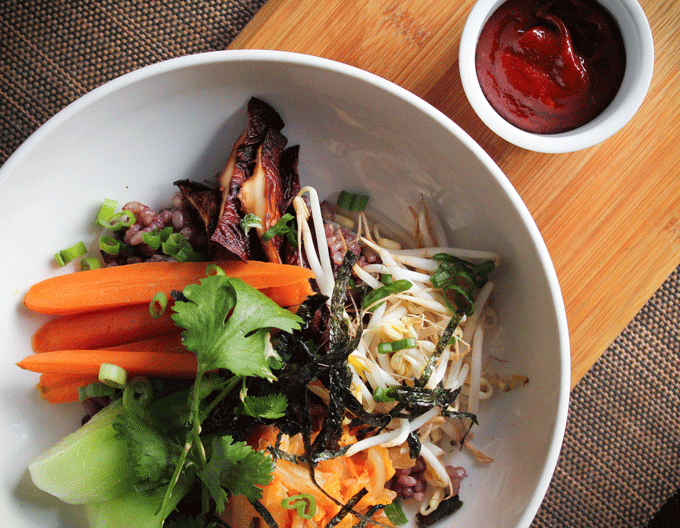 Bibimbop can be infinitely customized with seasonal vegetables, and any style of kimchee you desire! If you want to make your own kimchee, you can use this recipe. Kimchee is a super-beneficial food to consume-the beneficial bacteria helps support your immune system, keeps your skin glowing and improves your digestion. And did I mention it’s delicious? Bibimbop is one of my favorite rice bowls around! Whisk the gochujang ingredients together until smooth. Set aside until ready to use. Mix it into your rice bowl 1 Tablespoon at a time. Rinse rice in a colander for 30 seconds. Add the water and rice to a stockpot and bring to a boil. Cook uncovered for 30 minutes. Turn off the heat and strain the rice over the sink. Return the rice to the pot and cover, allowing the rice to steam itself for 10 minutes. Fluff with a fork before serving and season with salt to taste. Brown rice can be frozen for up to 3 months! Peel the carrots and cut into matchsticks. Set aside. Slice the cucumber in thin slices and toss with the agave, vinegar and salt. Set aside. Slice the shiitake mushrooms. Heat the sesame oil in a sauté pan and add the shiitake mushrooms. Cook until golden brown. Season with salt and pepper to taste. Cut the nori sheets into thin strips. Scissors work great for this task. Set aside until ready to assemble the bowl. Divide the brown rice into 2-3 bowls. Top with sautéed mushrooms, sprouts, nori strips, kimchee and cucumber. I have a question about the amount of water to add to the rice – EIGHT cups? I’ve never seen a recipe with that high a ratio of water to rice and just want to be sure about it before trying to make this. Thanks. hi Ines! Brown rice can be tricky to cook. This is a unique cooking method that will give you great results with brown rice everytime. oh my gosh! I was just talking about this with someone today!